The IP Power 9212 Delux is a controller and sensor device with 8 digital inputs and 8 relay outputs. You can easily control devices remotely and check the device status via the Internet from anywhere in the world. It features an embedded web server, security code identification and hardware reset function, polar protection, and LED indicators. This system can be integrated with your home or office automation systems, personal entertainment, or used for industrial field applications. This product can be used in conjunction with the Omnima Embedded controller SKU16140. The embedded controller can be set up as a DHCP server to connect IP Power to the Internet. 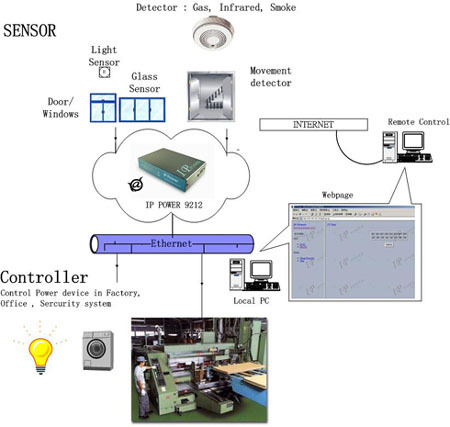 The embedded controller can also be programmed to turn the switches on/off or change the timer settings by using http post/get requests sent to connected IP Power devices.